It's not a truck it's tubes! 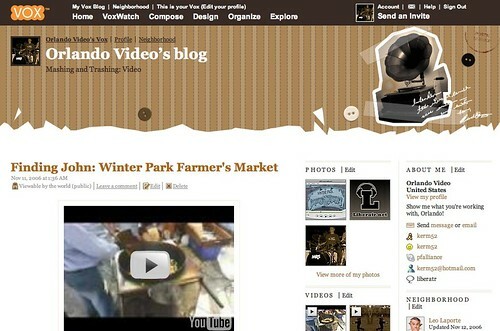 Orlando Video is a new Vox blog I just started to showcase videos from all around Central Florida, most of which I did not make. Hopefully, locals will email in their videos, links and YouTubes to the email address and we will have a romping good time viewing these videos and sharing them with the blogosphere. The first four videos are a music video from local alt-country princes The Heathens, a short performance of Improv Cabaret at Puppets From the Edge, and Finding John's Farmer's Market outing. My friend Dustin has also put together a fun short about a Lavanado that just made it to the blog. These are four videos with very different intents, but all worth checking out. I am still trying to decide if OV will be reviewed or juried, or if I will just post everything that comes across my virtual desk. Maybe you guys can help clear that up: comment. If you have something to say about the videos, the blog, or anything else, go there and leave a comment. Sadly, you have to register for Vox to do that, but I hear they're working on it. Vox is pretty neat in the way they're trying to bring LiveJournal-style privacy to Mom and Grandma. So far they've gotten a lot of things right. Keep up the good work, SixApart.